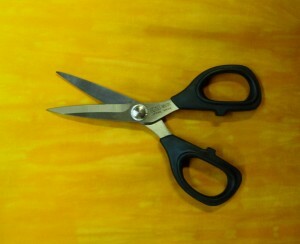 A pair of 5″ knife blade KAI Scissors makes free-cutting small fused elements like dots, flowers, and spirals easy. They are high quality blades with sharp tips that hold up to lots of cutting fun. Coat your threads with Thread Magic and your threads will glide through fabric. This thread conditioner helps prevent thread drag, fraying or tangling, and strengthens embroidery thread making it last longer. 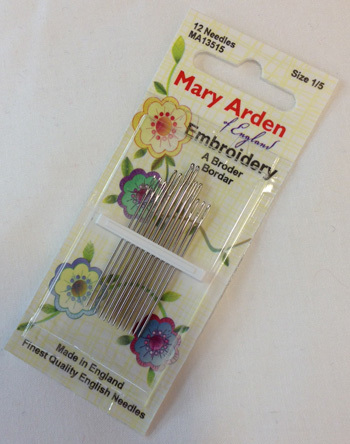 Recommended for hand embroidery with our pearl cotton threads. What’s that needle for? Use this guide with full-size photos of needles to identify the most commonly used hand-stitching needles. Lay a needle on the photo to determine the size and purpose of hand needles. From embroidery to quilting to milliners and more, you’ll be able to choose the right needle for the task at hand. Keep your pearl cotton threads tangle free and ready for stitching using this handy thread ring. 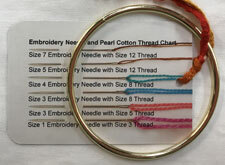 The Thread Ring comes with a chart showing you what size embroidery needle to use with what size pearl cotton thread. Follow this Tutorial on how to attach the skeins to the ring. 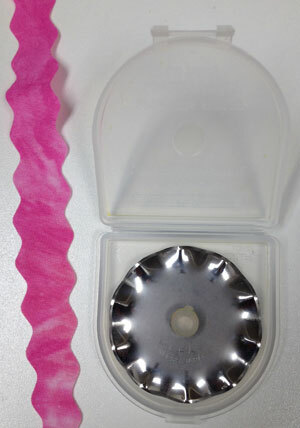 Add a decorative edge to your fused fabrics with a Pinking Blade. Use on your regular 45 mm rotary cutter handle. It will work on most Olfa or Fiskars brand handles. See this Tutorial on how to load the blades correctly. Add a decorative edge to your fused fabrics with a Scallop Blade. Use on your regular 45 mm rotary cutter handle. It will work on most Olfa or Fiskars brand handles. See this Tutorial on how to load the blades correctly. Add a decorative edge to your fused fabrics with a Wave Blade. Use on your regular 45 mm rotary cutter handle. It will work on most Olfa or Fiskars brand handles. See this Tutorial on how to load the blades correctly. 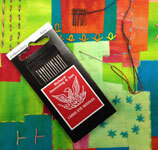 Use Schmetz Quilting Needles (size 14/90) to stitch through the top of your machine with our cotton 12 threads. They are sharp and strong enough for straight stitching as well as free-motion work. Use Schmetz Titanium Embroidery Needles to stitch through fused fabrics. The needle (size 14/90) does not heat up as much as a regular needle during stitching so your needle doesn’t gum up with fusible web. 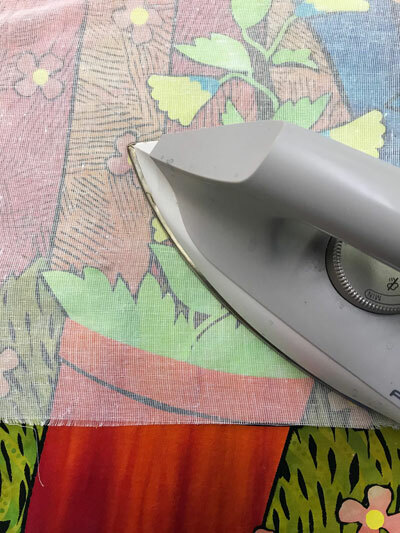 Silicone Release Paper is perfect for pattern transfer to fused fabrics, building fused collages, and protecting your iron and ironing surface. Highly recommended by the Chicago School of Fusing. Pellon Wonder Under #805 Fusible Web (17″ wide with release paper) is the best for all your fusing needs. Highly recommended by the Chicago School of Fusing. 2 Yards plus Chicago School of Fusing Rules of Fusing Etiquette. Use this cheesecloth like fabric to protect your fused quilt top as you steam set it for 10 seconds in each spot. The cloth saves your project from a filthy iron and keeps everything flat while you slowly glide the iron across the quilt. 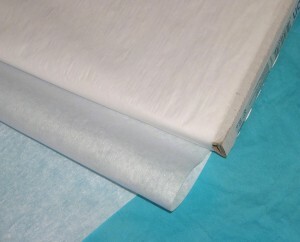 Timtex is a stiff interfacing used for making the wrapped binding for shaped quilts. 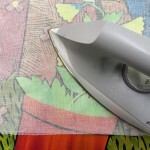 This curvy edged binding method is found in quilts like our flower patterns and in Fanciful Stitches, Colorful Quilts. Measures 13 1/2″ x 22″.